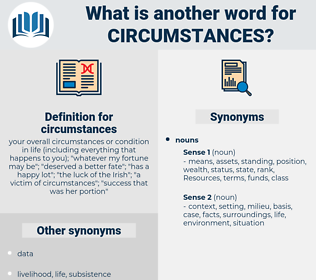 What is another word for circumstances? 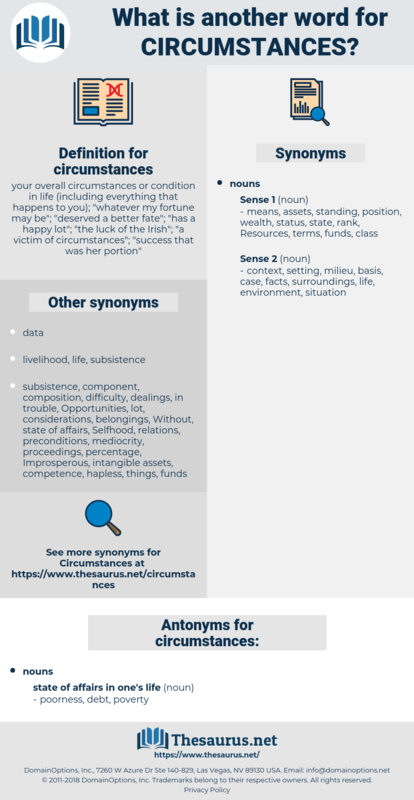 your overall circumstances or condition in life ( including everything that happens to you); " whatever my fortune may be"; " deserved a better fate"; " has a happy lot"; " the luck of the Irish"; " a victim of circumstances"; " success that was her portion"
instances, settings, Patients, arrangements, Standards, reports, nations, aspects, issues, developments, conditions, Cas, grounds. matters, incidents, aspects, observations, prerequisites, preconditions, issues, developments, TS, Cas, context. scenarios, stances, moments, specifics, Atmospheres, constraints, considerations, purposes, Characters, agreements, instances, Measures, particulars, institutions, Attitudes, characteristics, Emergencies, treatments, Adjustments, outcomes, factors, Difficulties, Realities, Relatives, attributes, Uncertainties, settings, accidents, conditionalities, Eventualities, relationships, principles, Sentiments, Crises, jurisdictions, patterns, materials, presumptions, positions, jobs, Criteria, motivations, allegations, shortcomings, reasons, restrictions, consequences, requisites, Particularities, sensitivities, influences, implications, assumptions, Capabilities, merits, exceptions, Possibilities, disasters, Opportunities, investigations, Regulations, structures, Peculiarities, stipulations, Patients, actions, Injuries, Reinforcements, interests, Sensibilities, complaints, arrangements, procedures, PROSPECTS, individuals, Crimes, Duties, specifications, experiences, residents, Migrants, connections, permutations, traits, Standards, Outbreaks, clauses, conflicts, indicators, Families, interventions, warrants, Categories, exemptions, distinctions, Exigencies, determinants, reports, trends, tasks, Stories, obligations, Persons, dimensions, qualifications, Activities, periods, Capacities, Phenomena, Organizations, excuses, differences, profiles, Areas, derogations, motives, results, moves, stages, amendments, specificities, subjects, contracts, sites, Infections, violations, demands, conventions, Contingencies, Clients, questions, Idiosyncrasies, endpoints, benchmarks, markets, practices, Communities, offences, Records, payments, Exercises, points, causes, Hypotheses, Populations, Resources, Movements, abuses, modalities, components, threats, claims, ratios, Provisos, problems, Rights, drivers, Guidelines, pretexts, disputes, ingredients, projects, Agencies, requests, Facilities, Lives, omens, features, upheavals, processes, deaths, scenes, applications, adaptations, products, offenders, speeches, reviews, limitations, data, kinds, uses, Referrals, episodes, Ideas, concerns, auspices, Charges, methods, limits, plots, Tests, Prices, Foundations, proportions, Incidences, meals, pieces, counts, inputs, directors, needs, hazards, centres, advances, types, files, Countries, members, parameters, references, awards, changes, wishes, signs, fortunes, lists, Properties, women, Forums, reforms, Ones, Studies, matters, posts, challenges, approaches, divisions, discussions, walks, queues, controls, Forms, OUTS, pipes, Bodies, figures, less, incidents, aspects, observations, makes, prerequisites, preconditions, issues, LINEs, developments, times, conditions, occasions, things, contexts, environment, Environments, Cas, species, pre-conditions, statuses, elements, surroundings, backgrounds, environmental, details, ways, context, means, grounds. contrasts, arises, happens, Comes, stands, Lives, matters. And never - never under any circumstances would she ask any of the guests what sort of an evening had been spent, how Mr. Wyse announced the news, and how the Faradiddleony played bridge. Under the circumstances it was right for her to come! ill luck, tough luck, bad luck, good fortune, failure, providence, Luckiness, good luck, misfortune.